Congratulations to Sarah Goodman for completing the N.C. Environmental Education Certification. Sarah works at Providence Day School in Charlotte, N.C., as a sixth through eighth grade science teacher and environmental sustainability coordinator. For her community partnership project, Sarah implemented a Trout in the Classroom project at her school. Trout in the Classroom is an environmental education program in which students raise trout from eggs to fry and eventually release the fish in a nearby stream, all while learning about water quality, conservation, and stream habitats. 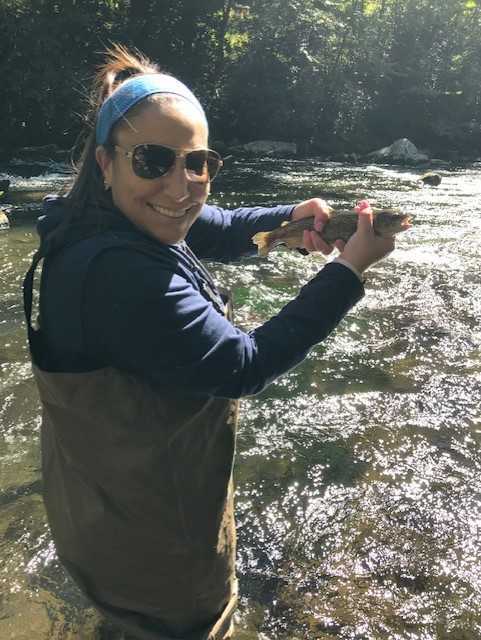 Sarah partnered with Rocky River Trout Unlimited and South Mountains State Park to complete the project. Starting in September, Sarah's students raised rainbow trout in their classroom at Providence Day School. During science classes, Sarah taught the students about bio-indicators in rivers, such as macroinvertebrates that indicate good water quality. 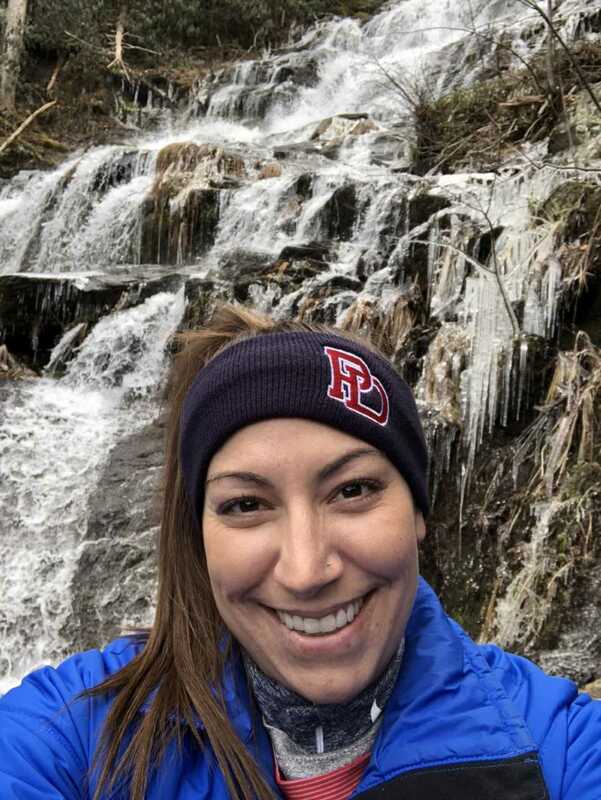 "I felt there was a need to connect the students in my classroom with outdoors spaces that went beyond school gardens and river cleanup," Sarah said. "By connecting the need for clean water with environmental stewardship, the students are able to see the impacts of keeping the land around our water systems clean." The students also learned the importance of cleaning the tanks where the trout eggs were kept and taking periodic water samples. At the beginning of the school year, Sarah taught the students about potential causes of death for the trout. This included a lesson on a fungal infestation that can kill the trout eggs before they hatch. 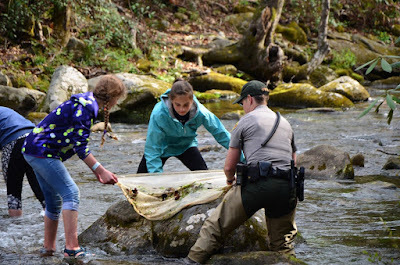 On release day, Sarah took the students (and the trout) to South Mountains State Park, where a park ranger gave the students an introductory lesson about the park's aquatic ecosystems. After releasing the trout in the river, the students spent an hour in the river collecting macroinvertebrates, fish, and other bio-indicators. Students use nets to search for macroinvertebrates on the river bottom. Sarah said the project "connects human activity to the health of an ecosystem and encourages youth to continue sharing their knowledge while doing their part for the environment." Trout in the Classroom wasn't the only new project that Sarah started at Providence Day School. She also implemented a nature journaling component in the student's semester work. 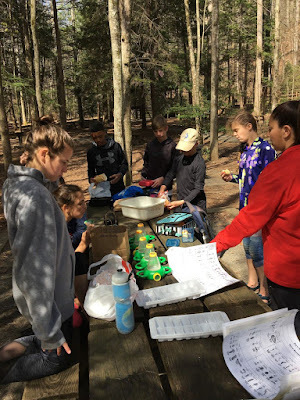 "Once or twice a month, the students receive a prompt and we take a break from content to go outside and observe the natural world...The hope is that the students are able to reflect better but also use their observation skills on their own explorations." Sarah said that participating in the certification program prompted her to approach science from a different angle, and to encourage her students to do the same. To learn more about the N.C. Environmental Education Certification program, visit the N.C. Office of Environmental Education website. If you are interested in implementing Trout in the Classroom at your school, visit the Trout in the Classroom website.